After the sudden and surprise Instagram post on L.A. 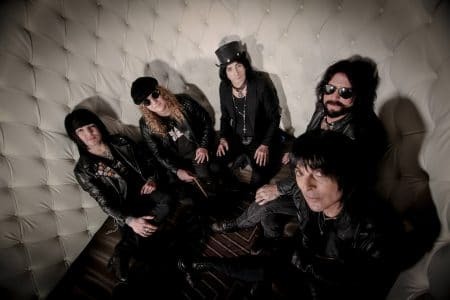 Guns guitarist Tracii Guns‘ account a few days ago that drummer Shane Fitzgibbon was being replaced by Scot Coogan, L.A. Guns have decided to clear the air on the circumstances of Fitzgibbon‘s departure following some speculation that the drummer left the band due to issues with Guns and lead vocalist Phil Lewis. Fitzgibbon played drums on L.A. Guns’ critically acclaimed studio album The Missing Peace(2017), their live album Made In Milan (2018) and their upcoming studio album The Devil You Know, which will be released in four days. Now that the dust has settled a bit, we wanted to take this opportunity to clear up any misinformation circulating over social media. Our brother, Shane Thomas Fitzgibbon, has left L.A. Guns to pursue a wonderful career opportunity that came his way. We totally support his decision to move on to the next chapter in his life, and we couldn’t be happier for him. Shane, you will always be a part of the L.A. Guns family, and nothing will ever change that. Also, Shane asked that we share some messages with all of you. We also want to take this opportunity to welcome Scot Coogan to the L.A. Guns family. Scot is an accomplished drummer and vocalist who has played with Tracii in Brides of Destruction, as well as Ace Frehley and Lita Ford among others. We are excited and fortunate to have him behind the kit replacing Shane.